In this class, you will learn the basics of the sewing machine including safety, threading the machine, straight and zig-zag stitching, backstitching, and pivoting. 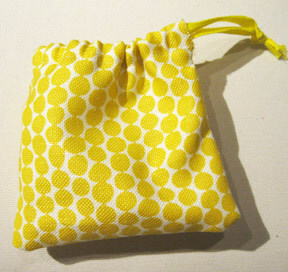 You will create a drawstring bag with the fabric and cord of your choice. That makes you the designer! It’s “sew” much fun to learn something new! Students will need to bring a sewing machine. Other required supplies include thread, seam gauge, sharp scissors, seam ripper, tape measure, straight pins and extra sewing machine needles. Optional, but strongly recommended, items include small, sharp scissors, rotary cutter, ruler, mat and the instruction manual for your machine. For the bag you will need 1/2 yard of fabric and thread of matching color. NOTE: If the fabric has a design, it should be one that looks right side up no matter how you hold it. You will also need 2.75 yards of cording or ribbon for the drawstring (I will supply the safety pins needed for insertion.) PLEASE NOTE: Class size is limited to seven.